She enlisted with Doctors Without Borders to provide health care to women near the civil war battle zone. (Steve Griffin | The Salt Lake Tribune) Kirsti Rinne talks about her experiences after returning from South Sudan, where she was a midwife for Doctors Without Borders and ran a 24-bed maternity unit. She spoke from her home in Salt Lake City, Thursday, April 12, 2018. South Sudan is a country at war with itself, where atrocities are common and medical care is scarce. But Utah midwife Kirsti Rinne didn’t hesitate to sign up with Doctors Without Borders to help women in a remote region of the east African country who otherwise would be without health care. Rinne, 36, a Brigham Young University graduate, also holds a nurse practitioner master’s degree from Boston College and additional credentials from the University of Utah in midwifery. She recently returned to Salt Lake City after three months in the small village of Lankien near the war zone. “I love Utah,” she said while sipping coffee in her condominium, speaking in relaxed tones of her experience half a world away, where there are no snow-capped mountains, running water or electricity. Life is hard there — and cheap. In reality, it was witnessing pain and death, helping some to survive and gaining a broader understanding of the human condition stripped to its essence. It was Rinne’s second stint with Doctors Without Borders, the international humanitarian group dedicated to providing medical care to people in distress. In 2015, she spent six months with the agency in Ethiopia. Presently, she works for University Hospital and Intermountain Healthcare. In South Sudan, she was the manager of a 24-bed maternity unit at the Doctors Without Borders hospital in Lankien, in the nation’s northeast region. The maternity ward receives about 100 admissions and delivers almost 50 babies each month, according to the organization. As the only trained midwife on site, Rinne was on call 24/7 and was responsible for overseeing all reproductive and sexual health activities, including the sexual violence program. Sexual violence to young women and girls in South Sudan is not a rare occurrence, she said. Although Lankien is relatively small, women from around the region seek help at the hospital there. Rinne lived in a small hut in a compound that included the 120-bed hospital. There was one working water well in the village but no electricity. The hospital, however, generates its own electricity. Of 300 staffers, 10 came from outside the country. Soldiers in such places usually leave Doctors Without Borders staff alone. Nonetheless, risks are prevalent and hospital personnel are on curfew and rarely leave the compound, Rinne explained. But she liked to take walks around the village. “I always had to wear my [Doctors Without Borders] shirt and have a radio on me,” she said. South Sudan is rich in oil. But most of the profits were kept in the Sudanese capital of Khartoum, near the northern ports on the Red Sea, where it is exported, mostly to China. That is chief among reasons why South Sudan broke away from Sudan in July 2011. By December 2013, the new nation began to unravel along ethnic lines. The ongoing conflict between President Salva Kiir’s government forces of the ethnic Dinka and former Vice President Riek Machar’s ranks of the Nuer people has displaced 4 million people and led to a catastrophic food shortage. Tens of thousands have died fighting. Not far from Lankien, tribes clashed during a cattle raid, Rinne recalled. Even without war, life there is difficult. Women in South Sudan routinely walk miles each day for water and scrounge food the best they can. Some young mothers have lost their husbands to warfare. An estimated 1.5 million are on the verge of starvation. One poorly nourished pregnant woman walked nine hours to the hospital and then delivered a 2.6-pound baby. The mother remained at the facility for two months before her child reached 4 pounds, Rinne recalled. By that time, the Utah midwife had become quite close with her patient and baby. 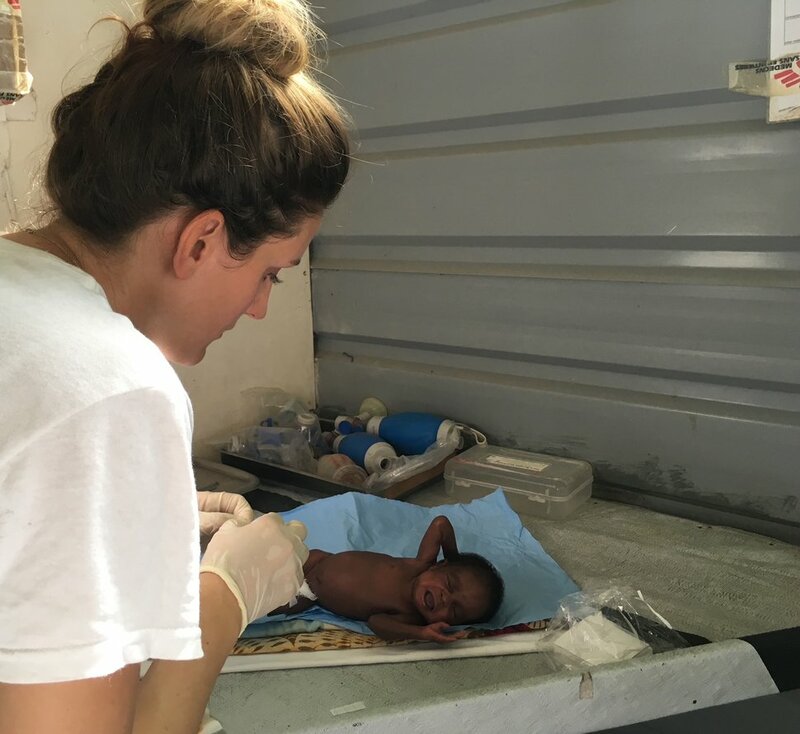 (Photo courtesy Doctors Without Borders) Utah midwife Kirsti Rinne treats an infant at a hosptial near the South Sudan village of Lankien. She just returned from a three-month stint as director of a 24-bed maternity unit near the war zone. The day after they dropped the young mother at her village, it was shelled by artillery. A month later, Rinne’s team returned to the village. Her patient had somehow survived by running into the bush with her child to find cover. In another instance, she informed a mother that her daughter was going to die. As she did so, Rinne began crying. But the woman, who spoke only Nuer, comforted her and told the medic to tell the midwife not to worry, everything would work out. From a young age, Rinne explained, she knew she dreamed of working in global health care. And she, too, wanted to make a difference. But at some point Rinne realized the social, political and geographic currents are more challenging than she expected. 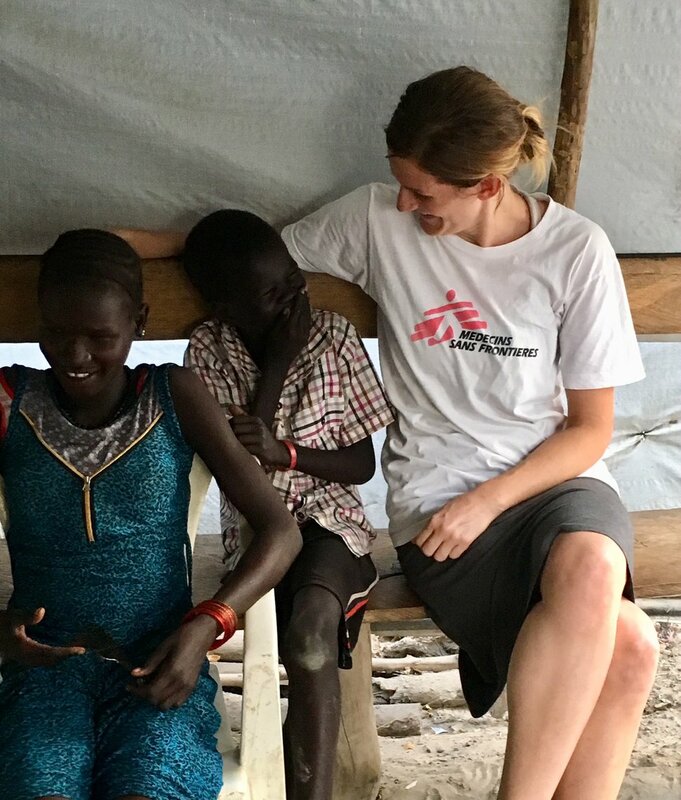 (Photo courtesy Doctors Without Borders) Kirsti Rinne jokes with some villagers during a break from her duties as director of a 24-bed maternity ward at the Doctors Without Borders hospital in the village of Lienkien in South Sudan.